The White House senior staff is sworn in at the White House in January. Twenty-two members of the staff will make $179,700 this year and 18 more earn $165,000 a year, making the Trump administration’s payroll top-heavy compared to the Obama administration. Chief strategist Steve Bannon and chief of staff Reince Priebus will both make $179,700 this year for their work at the White House, but they aren’t the only ones. 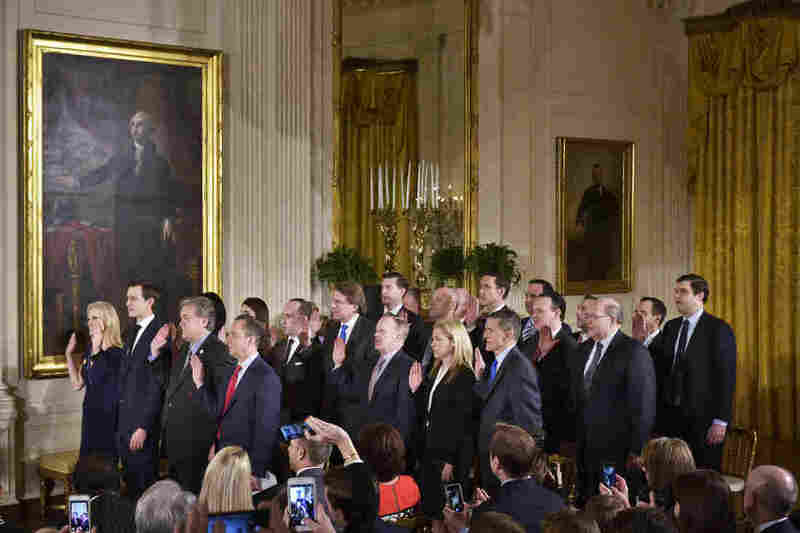 A new list of White House staff salaries released by the Trump administration (as required annually by Congress) reveals 22 people make the same top salary. Eighteen more earn $165,000 a year, making the Trump administration’s payroll top-heavy compared to the Obama administration. There are currently 377 White House office staff in the Trump administration, about a hundred fewer than were on the Obama payroll in 2016. And, by way of comparison, coverage of Obama’s 2009 report listed 487 staffers in his first year. With fewer people to carry the load, Cohen added, already difficult and stressful jobs get harder. “You have new levels of stress that few White House staff have ever had to deal with,” said Cohen. Press secretary Sean Spicer said in an email that the lean staffing was the result of the new administration “trying to give taxpayers the best return” — something the White House is endeavoring to do “throughout all government.” Spicer also noted “there is a huge demand for jobs” in the administration. One person makes more: Mark House, who is on loan from the FAA working on a short-term project, is set to make $187,100 this year. Sarah Sanders, the principal deputy press secretary who recently has been conducting most of the White House press briefings, earns $165,000 a year as does Keith Schiller, the director of Oval Office operations who was Trump’s longtime bodyguard, and Peter Navarro, director of the president’s National Trade Council. The median Trump White House office salary is $89,000 compared to a median salary the final year of the Obama administration of $73,051. 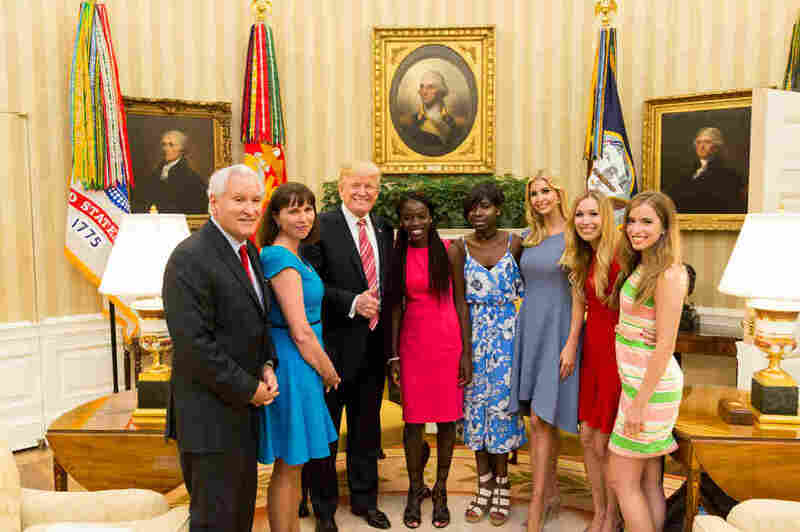 President Donald Trump and his daughter Ivanka flank Chibok schoolgirls (left to right) Joy Bishara and Lydia Pogu. At far left is Doug Wead, president of the school the girls attend, and his wife, Myriam. Two of his daughters are at the right. This White House “Photo of the Day” was taken on June 27. The White House usually picks a photo of the day. On June 28, the image they chose showed two girls from Nigeria who were abducted in 2014 by Boko Haram but managed to escape. They’re flanked by President Donald Trump and his daughter, Ivanka Trump. The photo had been taken the day before. Trump is giving a thumbs up. The meeting was not publicized in advance. NPR’s White House correspondent Tamara Keith says the administration didn’t notify the press corps about it, it didn’t appear on the White House daily schedule and it was not discussed in any of that day’s briefings. How did these two girls get to the White House? Doug Wead, who is also in the photo, was the point of contact. He’s the president of Canyonville Christian Academy, the Christian boarding school in Canyonville, Ore. that the girls just graduated from. Wead was an assistant to President George H.W. Bush and has published many books, including Game of Thorns: The Inside Story of Hillary Clinton’s Failed Campaign and Donald Trump’s Winning Strategy. He told NPR that Ivanka Trump reached out to him after his appearance on a BBC program about presidential children. The two got in touch via email and kept in contact. Wead asked her if she wanted to meet the girls because of her concern about human trafficking. She said “absolutely,” Wead says. And she and Pogu got a White House tour. “I enjoyed [the visit], it was wonderful,” she says. “Her [Ivanka’s] work is a really good one, at least she’s helping people around the world who have been hurt,” Bishara says. R. Evon Idahosa is a New York City-based organizer with Bring Back Our Girls, a campaign to free the captured Chibok girls. She says the purpose of the visit isn’t clear. “The administration has taken an America-first approach. I’m not exactly sure what the intent of the meeting was,” Idahosa says. Idahosa is also the founder and executive director of the PathFinders Justice Initiative, a nonprofit organization. She hopes the visit to the White House will raise awareness about the 113 Chibok girls in Nigeria still held captive by Boko Haram. Pogu and Bishara were two of 276 schoolgirls in the town of Chibok captured by the extremists. They escaped by jumping off a moving truck that the extremists were using to transport them, the girls told People in an interview. The Chibok kidnappings drew international attention and sparked the hashtag #BringBackOurGirls. Former first lady Michelle Obama backed the campaign. Boko Haram released 82 of the Chibok girls in May after more than three years of captivity. The group also released 21 of the abducted schoolgirls in October 2016. One student escaped with her baby in May 2016. Pogu and Bishara began attending Mountain Mission School in Grundy, Va., in 2014. They had been connected to the Virginia school through the Jubilee Campaign, an organization based in Fairfax, Va., that promotes human rights and religious liberty for ethnic minorities in countries that include Nigeria. Wead says that in 2016, the U.S. government asked Canyonville Christian Academy to take the girls in and cover all their expenses. The school granted them a full scholarship, including room and board. At the academy, Pogu and Bishara “would study nonstop,” says the school’s CEO, Corinne Burkhert. Pogu struggled to sleep at times because of “bad dreams” she says. The girls plan to start college at Southeastern University in Lakeland, Fla. this fall on full scholarship, spokeswoman Dana Davis said in an email. The university is reaching out to local churches and individuals to raise more money for the girls. Three of Wead’s children attended Southeastern, according to Davis. The girls are temporarily staying in Haymarket, Va., with Doug Wead. They say he’s like a father to them. They hope to spend most of the summer in Nigeria with their families. To raise money for summer living expenses and plane tickets to travel home, Bishara and Pogu started a GoFundMe account on June 8. So far they’ve raised more than $5,800. The girls aren’t sure how much money they’ll need in total, but the goal is set to $35,000, covering tickets that they say will cost about $3,000 and travel expenses within the country to reach their families. Canyonville Christian Academy currently manages the girls’ fundraising account and states that all donations “in their entirety” will go to the girls. A grizzly bear roams near Beaver Lake in Yellowstone National Park, Wyo., in 2011. 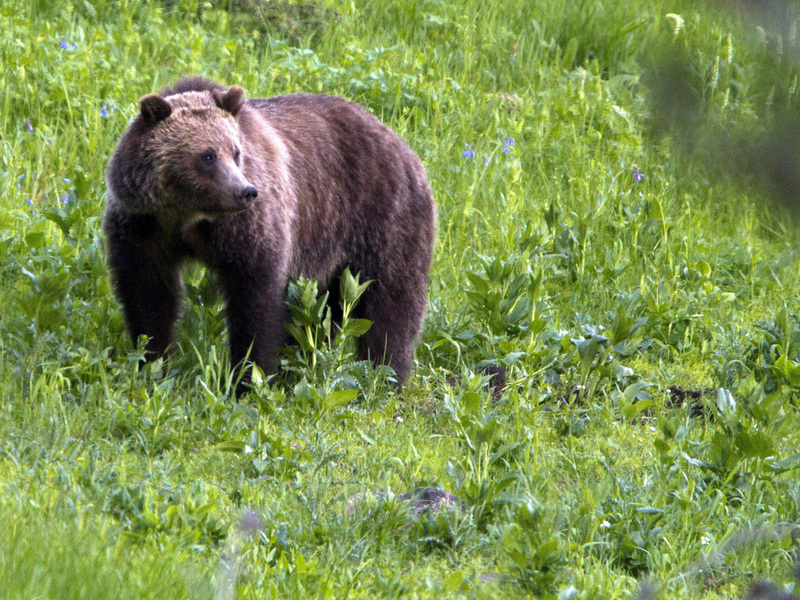 Advocates for Yellowstone National Park’s grizzly bears filed notice Friday that they’re prepared to sue to reverse the bears’ recent removal from the endangered species list. Grizzlies have been protected under the Endangered Species Act since 1975, when only 136 of them lived in the Yellowstone region, The Associated Press reports. The U.S. Department of the Interior announced last week that the park’s population of about 700 of the iconic carnivores would no longer receive federal protections. AP says the Northern Cheyenne Tribe, Center for Biological Diversity, The Humane Society of the United States and WildEarth Guardians are among the groups that have filed a 60-day notice of intent to block the move by suing the U.S. Fish and Wildlife Service. That step is required under the Endangered Species Act and is intended to give the agency a chance to address the groups’ concerns before they file a lawsuit. “The Greater Yellowstone Ecosystem population of grizzly bears has surpassed recovery goals in both population benchmarks and duration of time meeting those goals, proving that the population is not just recovered, but stable and growing. 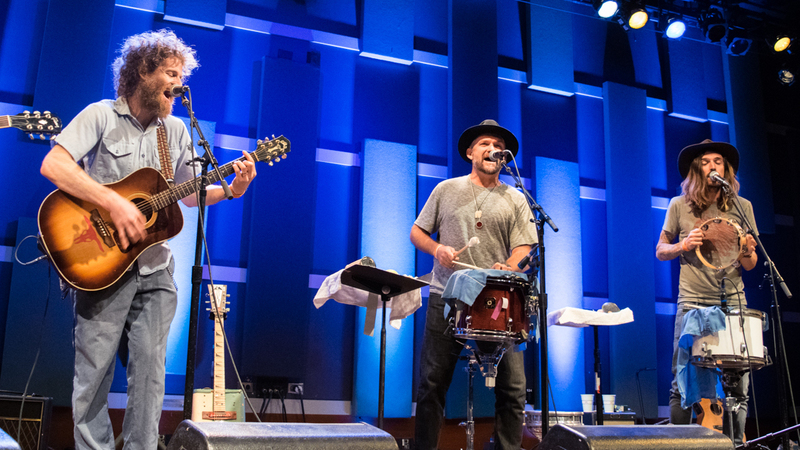 Dispatch performs at World Cafe Live in Philadelphia. So why did Dispatch break up anyway? We’ll get the story straight from the band, which performs live in this session. Listen in the player above, and watch the members of Dispatch bring back a song that every one of their fans can recite by heart, “The General,” in the performance video below. The small town of Madras, Ore., is expected to be a prime viewing location for a total solar eclipse on August 21, and authorities there are girding for a huge influx of tourists. Above, an ad for campsites in Madras on June 13. 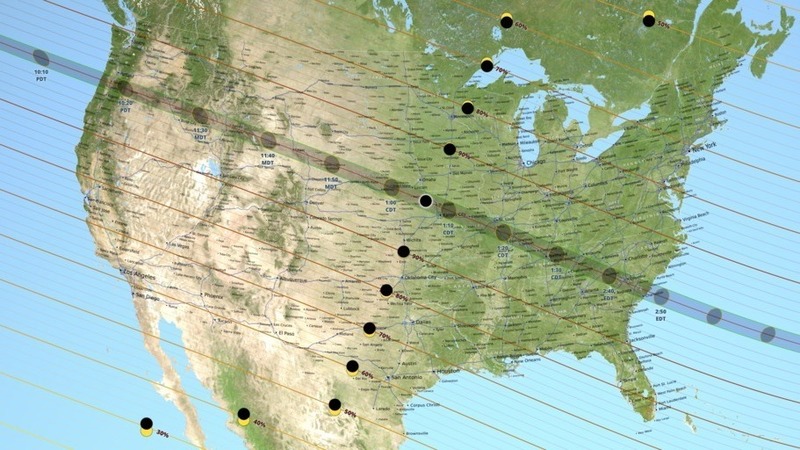 On Monday, August 21, a solar eclipse will be visible across America. The last time the contiguous United States saw a total eclipse was 1979, and it will be the first coast-to-coast solar eclipse in 99 years, reports the Associated Press. A partial eclipse will be visible throughout the United States, according to NASA. But within a band the agency is calling the “path of totality” stretching from Oregon to South Carolina, viewers will witness a total eclipse. And in many of those places, an eclipse industry is already booming. The mayor of Hopkinsville, Ky., says his town has spent more than half a million dollars preparing for the event since learning 10 years ago that it would be in the path of totality. The town even has an eclipse coordinator. A map of the United States showing the path of totality for the August 21, 2017 total solar eclipse. Homes on Airbnb that are being rented specifically for the eclipse are renting for thousands of dollars a night – like this one, in Casper, Wyo. Perryville, Mo., is on the path of total eclipse. “We don’t normally rent out our house because this is not normally a tourist destination,” the town’s public works director, Mark Brown, told the St. Louis-Post Dispatch. He said he had listed his house on Airbnb for $2,500 a night during the eclipse, with a three-night minimum. The Charleston Post and Courier reports that a million people are expected to visit South Carolina for the eclipse. Like other places on the path, Charleston’s visitors bureau has set up a website listing area viewing events and hotel packages. Total eclipse will occur there at 2:48 p.m. ET, according to NASA. Oregon will be a major hot spot for eclipse-watchers. Viewers there will experience the total eclipse first, with Salem and Corvallis in the path of totality at 10:18 a.m. PT. Like South Carolina, the state is bracing for a massive influx of visitors. 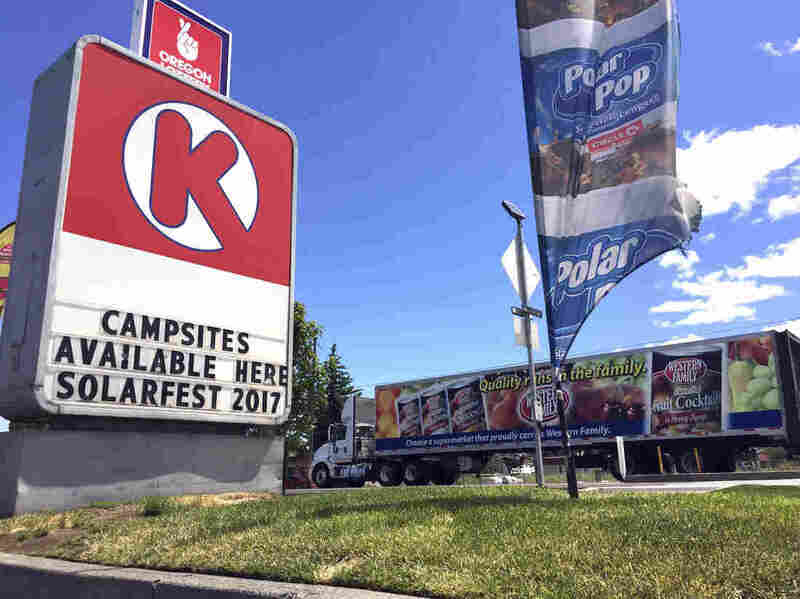 Up to a million people are expected to travel to Oregon for the event, the AP reports, and the area around the small town of Madras is expected to draw 100,000 people – with the potential for out-of-this-world traffic jams. Authorities in the state worry that if it gets foggy, people will decide to head east at the last moment, creating chaos on the roads. The Oregonian reports that all of Oregon’s reservable campgrounds within the path of totality have already been booked. The state released an extra 1,000 campsites in April – those, too, were booked within 90 minutes. “Weaver said her worst case scenario is campers losing patience and getting into verbal or physical altercations over campsites – a situation that could be exacerbated by the August heat. Unprepared travelers are also a concern, especially considering most of the non-reservable campgrounds are remote, and often don’t provide drinking water or toilets. And in case you were wondering: yes, there will be glamping, and no, it won’t be cheap. The Deluxe Canvas Bell Tent for 2 will run you $1,500, not including admission fees. In Madras, a town of 6,500, local event planner Lysa Vattimo has been hired to be the city’s eclipse planner. She toldThe Oregonian that the town will spend at least $100,000 to manage the throngs eclipse-chasers. Clara Hardy (middle) with her parents, Robert and Chrissy. 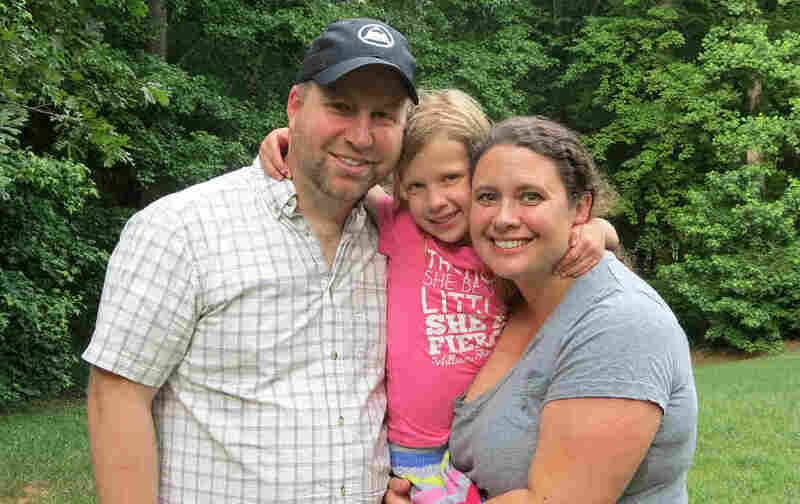 Clara, who lives in North Carolina, needed expensive surgery and other procedures right after birth to save her life. The family’s insurance policy paid most of the cost. The health care legislation under discussion in the Senate could allow states to remove some of the Affordable Care Act’s consumer protections — including the prohibition that keeps insurers from limiting how much they’ll pay for medically needy, expensive patients. Clara Hardy’s parents worry about the Senate bill for just this reason. These days, 6-year-old Clara’s biggest struggle is holding her breath long enough to touch the bottom of the neighborhood pool. But immediately after she was born in 2011, she couldn’t even breathe. She had a serious birth defect called a congenital diaphragmatic hernia. “We were told more than once she would not survive,” her mother adds. But after many procedures that Chrissy estimates cost more than $1 million, she finally got to cradle her baby. At the time, the whole family had health insurance through Chrissy’s job as a public school teacher. So their out-of-pocket medical costs were just $10,000. Those benefits, under the Affordable Care Act, must be covered by insurers, with no lifetime or annual caps on what insurers chip in to cover a particular patient’s bills. The ACA also sets an annual maximum on the amount of money a patient must contribute to help cover the bills. Under the proposed Senate bill, if one of the ACA’s “essential benefits” — such as pregnancy and childbirth, prescription drug coverage and mental health services — is no longer deemed essential by a state, that leaves the door open to insurers to charge more for plans that include those benefits. This could even bring back lifetime caps on how much an insurer would pay for such services for a particular patient. Hospitalization, emergency services and prescription drugs are just some of the 10 benefits that Clara needed — and might need again. The details of how any change in the federal health law rules would play out in various states and in each health policy are still murky; the GOP Senate bill is still in draft form, and a lot will be left up to the state. But Clara’s dad, Robert Hardy, is worried. “I don’t really know what the limit would be, but there is probably a good chance that she’s hit it,” he says. Matt Fiedler, a health care economist with the Brookings Institution, warns that if the GOP bill passes, the problem of lifetime limits on what insurers could be counted on to pay for an insured patient’s care could spread quickly from state to state, because large companies that offer health insurance could choose the list of “essential health benefits” they include in their policies from any state. “If you are an employer with 150 employees — so you are buying large group market coverage, and you are entirely in Pennsylvania — you can choose Mississippi’s definition of essential health benefits for the purposes of the lifetime limit provision,” Fiedler explains. While many businesses offer insurance to keep good employees, some may cut costs by offering policies with fewer benefits. And people who buy insurance plans from the exchanges would likely be limited to what their state of residence is willing to cover, says Fiedler. That means the GOP bill, if passed, could effectively gut protection for pre-existing conditions. If a state can let an insurer opt out of offering prescription drug coverage, for example, people who require medications would probably be paying more to have them covered. The Hardys now get their health insurance through the North Carolina exchange — they were able to get it despite Clara’s past health problems. Worries about how the cost could climb, if the GOP bill becomes law, keeps her dad up at night. “I would like to be able to be in a situation where I knew I didn’t have to worry if I was going to have to face a decision to bet my financial security against my child’s health,” Robert Hardy says. As Clara reads her book, she lifts her pink shirt a little, to reveal a scar that cuts diagonally across her entire stomach. This story is part of NPR’s reporting partnership with WFAE and Kaiser Health News. This weekend is forecast to be the “most traveled Independence Day holiday,” ever. Whether you’re driving around the country, heading across town for a cookout, or plotting a mental vacation, spend your travel time wisely and treat your ears to some new podcast finds from NPR. Did you binge-watch the second season of Master of None faster than you would have liked? Catch host Sam Sanders talking to producer, writer, and actor Lena Waithe about microwavable pork rinds, powerful storytelling by people of color, and writing and acting with Aziz Ansari. Depending on the length of your road trip, you might just begin to question reality. Follow hosts Alix Spiegel and Hanna Rosin as they set out to find how it’s possible for two people to look at the same thing, but see two different realities. After-episode philosophizing guaranteed. Traveling with kids? Connect, look up and discover the wonders in the world with hosts Guy Raz and Mindy Thomas. Join them as they explore why North America was once covered in ice, and how a comet strike helped to shape our planet as we know it. People who share the same birthday are slightly more likely to get married to one another. People named Carpenter are more likely to be carpenters. Those with the last name Baker are more likely to be bakers… and so on. In this episode of Hidden Brain, host Shankar Vedantam explores the IKEA effect: humans’ preference for things that are made by and associated with us. Ever find yourself in a conversation about race and identity where you just get… stuck? Hosts Shereen Marisol Meraji and Gene Demby examine feeling fake, or inauthentic, in given identities, along with bi-racial and multi-cultural listeners who shared their own views. Stressing out about what to bring to your holiday cookout? Work on that potato salad while drawing inspiration from host Guy Raz’s interview with Chef José Andrés. As a kid, José Andrés tended fires for his father’s backyard paella cookouts. Later, he trained with the best Spanish chefs, and began building a restaurant empire that would transform the way many Americans dine out. By the end of this episode, you may ditch the potato salad in favor of paella. Developing a healthy culture and media consumption diet can present a real challenge. Glen Weldon, Stephen Thompson, Linda Holmes and special guests Mallory Ortberg and NPR’s Audie Cornish talk talk about when you hang in with culture until the very end—and when you should quit. “Don’t date somebody who thinks that your preference in TV or movies is the same thing as a character trait,” quips Mallory. Emily Sullivan is NPR’s summer 2017 social media communications intern. Many upper caste Hindus consider the cow holy and have long rallied to ban beef eating. Critics of the government see the new animal cruelty rules as an effort to cater to these demands. Walk through any meat market in India, and you’ll see chickens cooped up in tiny cages, squished together in their own waste. Carcasses of goats hang from hooks at butcher shops, as the next goats wait in line for their fate. So when India’s Ministry of Environment issued new rules recently about animal cruelty in livestock markets, much of it was welcome. For example, the ministry said animal markets needed to have water and fodder, veterinarian services and humane modes of transportation. But one section of the new rules has set off a firestorm about people’s right to eat what they want, state rights and religion. It also threatens the livelihoods of small farmers and raises the specter of an economic bodyblow to one of the world’s largest beef exporting industries. All this comes at a time of growing number of violent attacks against beef-eating minorities by Hindu extremists. The new rules forbid the selling of cattle, including cows, calves, bullocks and buffalos at livestock markets for slaughter. Both the buyer and the seller of these animals have to give written declarations to local authorities that the animal is not destined for slaughter. Slaughterhouses can still buy animals directly from farmers, but not in marketplaces. However, most small farmers sell to local markets because slaughterhouses are far fewer and often a great distance away from farmers. And some states don’t even have slaughterhouses. Hindu groups in India, who consider the cow holy, have long wanted to ban cow slaughter. But beef eating is more common here than many realize and it’s growing. India’s 180 million Muslims eat beef. Tribal communities, especially in the northeast prefer it, too. It’s also common among poorer, lower caste Indians, because it’s cheaper than chicken and goat. 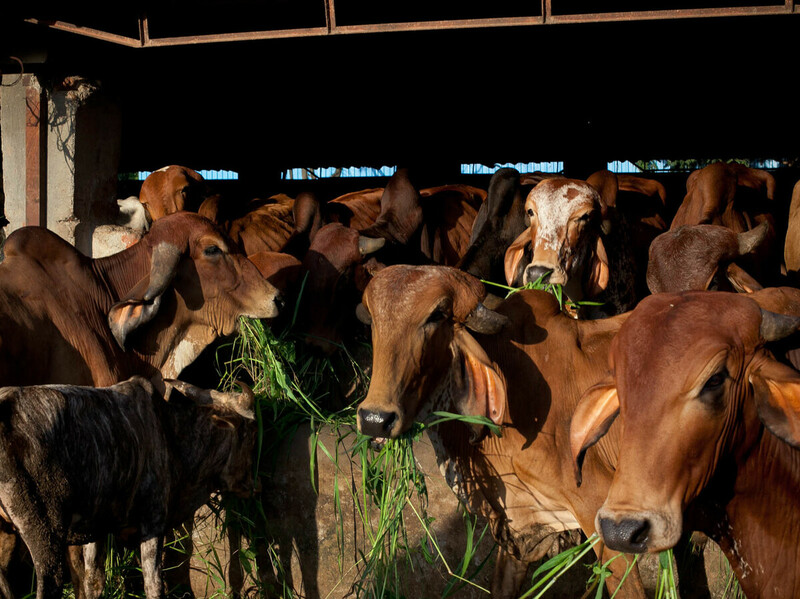 Existing animal slaughter rules – set by Indian states – reflect this diversity in diets. Some states allow the slaughter of all cattle. Some states forbid it entirely. Most allow slaughter of water buffalos for meat. By making the rules about cruelty rather than slaughter the government – which is headed by a right wing party with close ties to a Hindu-nationalist group – is seen as bypassing state laws. “It is saying slaughter is akin to cruelty,” says Sagari Ramdas, a veterinarian who is also a member of Food Sovereignty Alliance India. Critics of the new rules see them as banning cattle slaughter through the backdoor. A direct nationwide ban could be seen as an attack on freedom of religion, they say. Those in support of the ban insist reading anything more than animal cruelty into the law is mischief-making. Nugehalli Jayasimha, director of Humane Society International in India sees it as a “win-win situation for the animal, the producer and the consumer.” He would have preferred to see goats and chickens included in the new rules, but he says that’s more difficult to implement given the sheer number of small poultry and livestock farmers. But the rules could disrupt a carefully balanced rural economy, says Abusaleh Shariff, an economist with the US-India Policy Institute. Shariff explains that with farms becoming more mechanized, cattle are no longer used for plowing fields as much. These days, India’s 300 million plus cattle are used for milk and as a safety net for farmers in case of crop failure. Many farmers eventually sell their ageing animals at livestock markets for their meat and hide. The new rules make it impossible to do so. Ramdas says ironically in the name of saving the holy cow, the government could be harming it. She points out that states that currently allow cow slaughter have 80-90 percent cows in their cattle population. She predicts the new rules will mean farmers will just abandon old cows. She saw this happen with bullocks when the state of Maharashtra banned bullock slaughter in 2015. “In one year we saw a massive collapse of the bullock economy since there were no buyers,” says Ramdas. “We also saw a huge increase in the number of stray animals especially in times of drought.” Unable to sell older animals, farmers abandoned them. The ripple effects of these rules will be felt far beyond the farmer, says Shariff. India accounts for 20 percent of beef exports in the world, which includes water buffalo meat, or carrabeef. The All Indian Meat and Livestock Exporters Association predicts the ban could cost 2.5 million meat industry jobs. And according to the Indian Express, a national daily newspaper, the Progressive Dairy Farmers Association worries its business is in jeopardy. Cows live up to 25 years but give milk from 3-10 years. Forty percent of the dairy industry’s income is from selling off unproductive cows to the meat and leather industry. The All India Skin and Hide Tanners and Merchants Association has been around for a century, but the mood at the organization is glum. “We are fearing that [the] supply chain will stop. There is confusion and nervousness,” says its president Rafeeq Ahmed. This fight is also feeding into India’s Hindu-Muslim tensions. Many employees at slaughterhouses and tanneries are Muslims or Dalits, once called untouchables. “Their livelihood is being eliminated with no plans for rehabilitation,” says Shariff. Meanwhile, cow vigilantism has been on the rise in recent years, with mobs of upper caste Hindus attacking Muslims and Dalits for allegedly killing or eating cows. Last year, some Dalit youth skinning a dead cow in the western state of Gujarat were stripped and flogged by a group of men. A Muslim dairy farmer taking cows from the market was killed in Rajasthan in 2017. Last week a Muslim teenager was killed in a train. The attackers accused him and his brothers of carrying beef. While Indian Prime Minister Narendra Modi finally condemned the recent spate of attacks this week, his critics see the new animal cruelty rules as the government’s efforts to appease anti-beef Hindu activists. Several states have challenged the new rules in court for trampling their rights, violating a cattle traders’ right to free trade and impinging on religious freedom. India’s Supreme Court has asked the government to file a response by July 11. Based in Kolkata, Sandip Roy is the author of the novel Don’t Let Him Know. 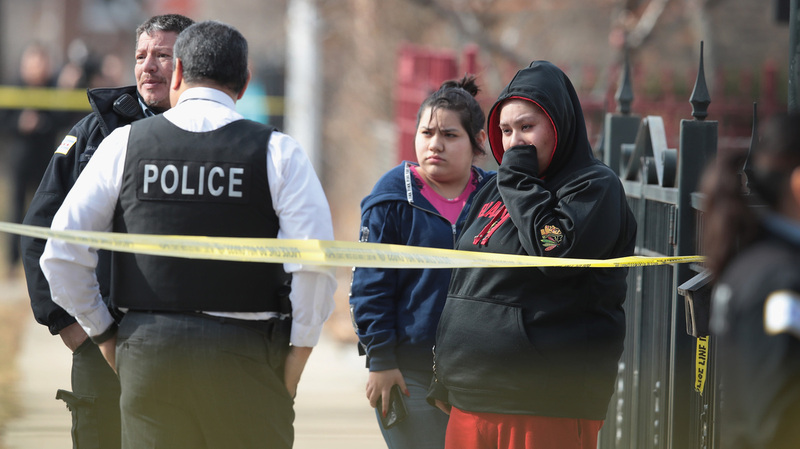 Police investigate the scene of a double homicide in Chicago in February. More than 1,700 people have been shot in the city so far this year. President Trump says he is “sending in Federal help” to Chicago to help curb gun violence. The president tweeted early Friday that crime in Chicago has reached “epidemic proportions,” referencing the nearly 2,000 shootings in the city so far this year. Crime and killings in Chicago have reached such epidemic proportions that I am sending in Federal help. 1714 shootings in Chicago this year! The tweet came ahead of a press conference announcing a new ‘Strike Force’ — a collaboration between the federal Bureau of Alcohol, Tobacco, Firearms and Explosives bureau and the Chicago Police Department. Twenty ATF agents have been permanently sent to the city for what officials called a “laser focus” on the illegal trafficking of weapons. They join 41 ATF agents already in Chicago. The force will also focus on investigating and prosectuing repeat gun offenders. “We want to get to the people who are putting some of these guns on the street illegally,” Chicago Police Chief Anthony Riccio said. “It targets the violent offenders who have no regard for human life,” said Leo Schmitz, Illinois State Police director. Carolina Camacho fuses Dominican folkloric music, vocal melodies and powerful lyrics. She discusses her album, Afrotaína, and accepting her Afro-Latina Identity.